On April´s Fool of last year, I was opening my first digital scrapbook store, because I love to design and I wanted to have some extra bucks, specially for the months where usually my craft business doesn´t have that much profit. I chosen to start at ScrappyBee when Charly made the first designer call for that store - the idea of starting together with the store was really attractive to me. However, the 120-140 days with very slow moviment that I was predicting (because it happened in previous years) ended up being only 27 days - the store only got slowest after December 20th (and not November 25th, as usual) and was back in action on the third week of January. It´s profting around three times the same month last year and a month like Faburary, that used to be a very slow month, has a slightly bigger profit than a "ok" month from last year. As I work only with help of my DH, that is involved in a medium-term really draining freelance job, I´m working 24/7 on my craft business! It´s been hard even to find time to relax in some weeks. I´m in fact working more than I used to do when I was a 44 hours/week employee - but my job now is for more pleasant! Meanwhile, if you know a neat store, where all products are full sized and there´re no posers that could shelter my creations with no store duties, please let me know! I would also love to know of some people that would like to QC or make some sample layouts with my next kits even knowing that they´ll take some time to be released. 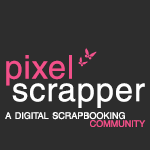 Even if I take some months to write again in this blog, feel free to contact me via e-mail (loriensworkshop at gmail.com), facebook and Pixel Scrapper. Happy 2015! 2014 was a great year to me, since it was the year I first opened a digiscrap store, and also got really busy with my craft business. But I´m taking time on January and Februrary to start designing kits to put on my store through the first semester - Maybe I´ll have time to join some more blog trains before the events season starts? Note: If you saw my preview on ScrappyBee thread, I´m sorry for having to substitute the orange/red paper. The texture on the other wasn´t good enough for quality standards and I didn´t have time to redo it - so, since I alrerady have more stuff with this colors ready to go to the store in February, I picked a paper with the same color combinations in exchange. Thanks for reading! Have a Bright New Year! This week is a special week at ScrappyBee, since we are having our first Stocking Stuffers sales. Each design has at least 4 items for sale, and I deceided to mark all my kits and extra packs down. I hope you enjoy! 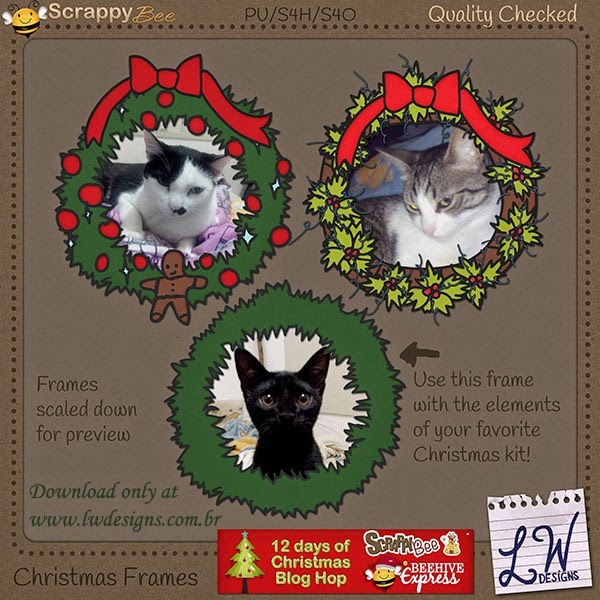 Welcome to Scrappy Bee Designers 12 days of Christmas blog hop! It may still not be Wednesday for you, but since we´re in summertime here in São Paulo, Brazil, it´s already time for your freebie! Sooo, did I convince you? If so, download your freebie here (it´s a direct download) or clicking in the preview above. 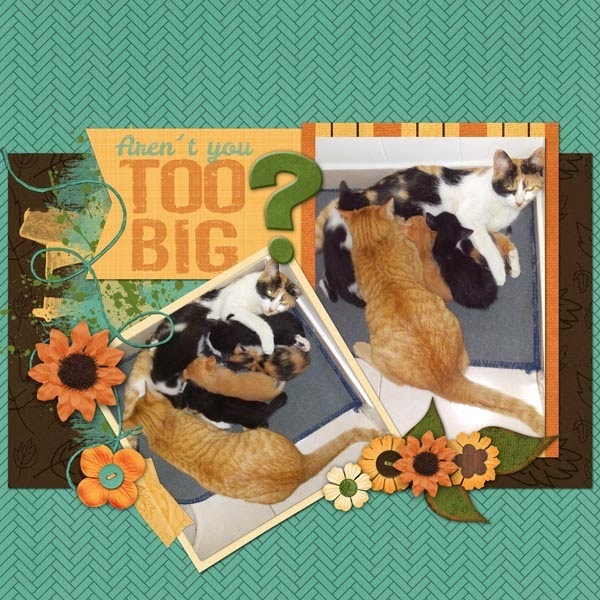 Now, back to the blog hop :) You have another spot today - if you still haven´t been on Sweet Dreamer By Sharon E. Grant´s blog, this is your next hop. (note that we´re on different time zones, and I´m ahead). 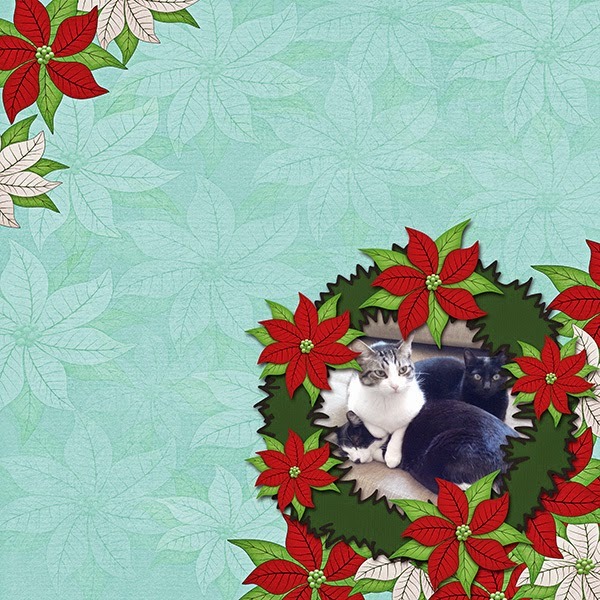 And tomorrow, December 18th, your blog hop continues on Gypsy Butterfly´s blog. If you get lost, or want to see the previous entries, you can find the master list at the Scrappy Bee Forum. If you´re new to my blog, don´t forget to check my other freebies clicking on the free stuff link in the top bar. To see more details and grab yours, go to my store. 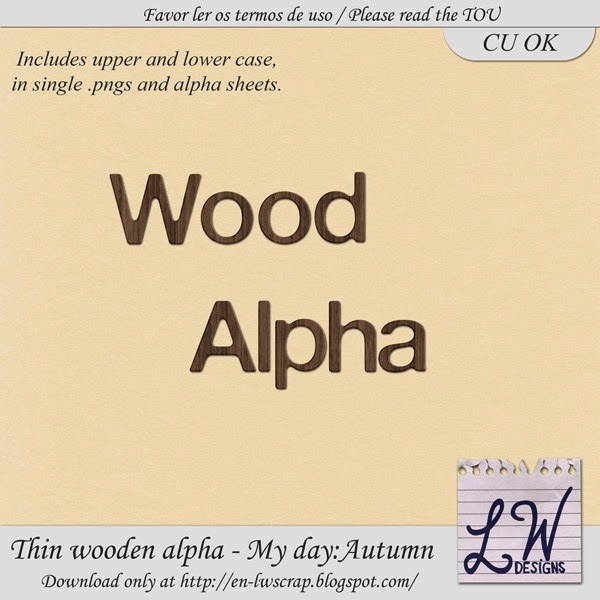 My template packs are usually $2,99, so, for the price of one you can get both of them and the Seashore or the harvest paper pack (that goes very well with My day: Fall kit) as a gift. Cool, isn´t it? Do you want an alpha? 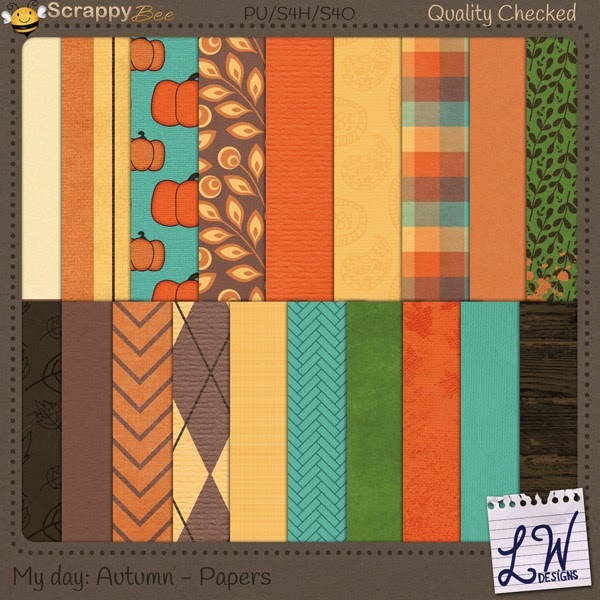 Today I am releasing a new kit at ScrappyBee: It´s called My day: Autumn, and is a very special kit for me. It´s the first full kit when I used lots of hand-drawn elements - Now I feel that my drawing skills are getting to a satisfactory point :) It´s also my first full kit where I mixed elements made with blocked daily life style in mind. As always, I made the kit in a way I´d like a kit to digiscrap with: No "just recolored" stuff - even the solids have one texture each, no stacked flowers - they´re awesome, but I really like to have flowers that I can stack myself - and with a touch of artsy stuff and the woodgrain design trend - I simply love to play with different trends in my kits! The harvest subway art and the wordart on the top are both in no-texturized black, so they can be used in several ways to match not only this kit, but any other you´d like to use. 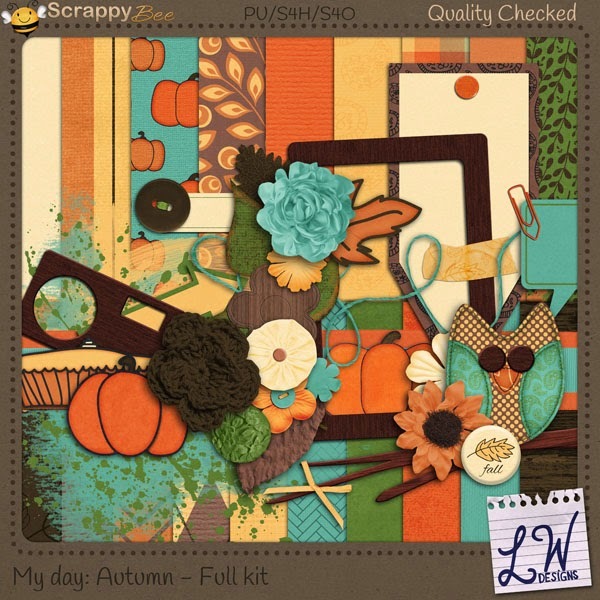 Do you want to mix and match My day: Autumn with another kit? Maybe clipping a paper from the other one in these word arts can be a good start :) What are you waiting for? Buy it here! Cool, isn´t it? 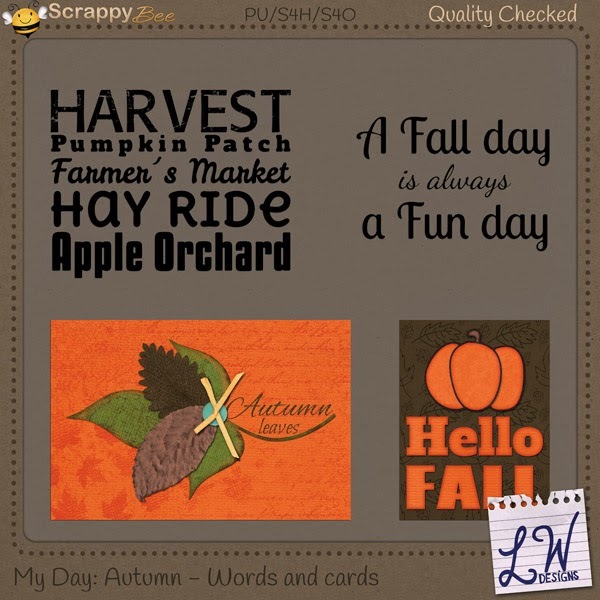 Don´t forget to stop by my store to see what I have to offer - and buy while it´s on sale - and take a look on the awesome ScrappyBee designers - we have hundreds of cool products waiting for you!